1Faith is the confidence, assurance and substance of things hoped for – things we confidently expect to happen. It is the conviction and evidence of things not yet seen. When we face discouragement, one of the areas in which we’re hit is our faith. If our faith was strong, we would have confidence that God’s promises are “yes and amen!” (2 Corinthians 1:20). When our faith sags, we struggle to see our hope and future in Christ. In this series we’re looking at how to build our faith so we can naturally move further and further away from discouragement. 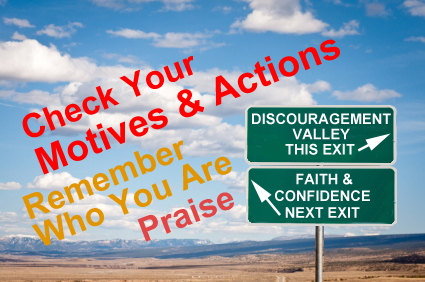 After starting to build your strong foundation of faith with praise (Faith Building Action #1) and building your courage by remembering who you are in Christ (Faith Building Action #2), you’re ready for a bit of self-reflection. In this step we’re going to ask the Holy Spirit to reveal our own attitudes and motivations to us. Begin your time with the Lord with praise and build your confidence in Him by reminding yourself who you are in Christ, then begin the exercise of looking at the things you do for the Lord. What’ your motivation – are you acting out of duty or love? Of course you love the Lord, but sometimes we take on things that He doesn’t really want us to do and they become drudgery. That drudgery becomes duty and we are no longer serving out of love. Or perhaps we’re doing exactly what God wants us to do but our own heart has grown cold and service has become duty instead of passion and love. Sometimes we’re faced with serving in a way we’ve served many times before. When that’s the case, it’s easy to rely on our own abilities, personality or strategies – after all, they’ve worked so well in the past. Before we know it, we’ve moved ahead without asking God what His plans and strategies are. We might be faced with a new opportunity that we’re so excited about – perhaps it’s an opportunity we’ve prayed for. We’re full of ideas, energy and enthusiasm. In those times it’s easy to jump right in making plans and motivating others to help us…again moving ahead without asking God what His plans and strategies are. Still other times we find ourselves creating our own opportunities – pushing ahead of God’s timing to accomplish what we believe He’s told us to do. And perhaps He has told us but we are either out of sync with His timing or his approach. When we’re pushing to bring about God’s plans (or our plans for God) we find our selves moving ahead without asking God what His plans and strategies are…or perhaps we’ve asked but haven’t waited long enough to hear His answer. Be honest with yourself and God as you reflect on these two questions. Don’t be afraid of it. Remember, there is no condemnation in Christ. There is conviction when we’ve sinned – and both of these actions can be sin. But the purpose of conviction is to give us the opportunity to change – to repent – and return wholeheartedly to the Lord. Ask forgiveness if you’ve begun to serve out of duty instead of love and ask God to restore your love for Him. (It’s a prayer He loves to answer.) Ask forgiveness if you’ve served in your own strength instead of God’s and ask Him what your next action should be. 1I waited patiently for the LORD to help me, and he turned to me and heard my cry. 2He lifted me out of the pit of despair, out of the mud and the mire. He set my feet on solid ground and steadied me as I walked along. 3He has given me a new song to sing, a hymn of praise to our God. Many will see what he has done and be amazed. They will put their trust in the LORD. 4Oh, the joys of those who trust the LORD, who have no confidence in the proud or in those who worship idols. 5O LORD my God, you have performed many wonders for us. Your plans for us are too numerous to list. You have no equal. If I tried to recite all your wonderful deeds, I would never come to the end of them. This entry was posted on Tuesday, October 2nd, 2012 at 8:58 am and is filed under Christian Living, Discouragement, Faith, Humility, Serving God. You can follow any responses to this entry through the RSS 2.0 feed. Both comments and pings are currently closed.